Weeks away from their one-year anniversary, Mallory and Connor Duncan can't even agree on how to end their marriage. But when a last-minute crisis lands them on a 3,000-mile road trip together, Mallory wonders if their story may not be over after all. 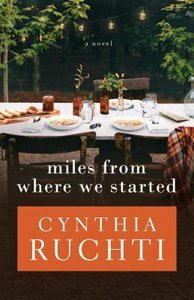 About "Miles From Where We Started"
Cynthia Ruchti writes and produces the daily 15-minute radio broadcast, The Heartbeat of the Home, and is editor of the broadcast's Backyard Friends magazine. She served a two-year term as president of American Christian Fiction Writers and currently serves as ACFW's Professional Relations Liaison. In addition to writing novels, devotionals, and magazine articles, she speaks for women's events and writers' conferences. Cynthia and her plot-tweaking husband live in the heart of Wisconsin where she creates stories of Hope-that-glows-in-the-dark. Find Cynthia on the web at www.cynthiaruchti.com.